Laminotomy Surgery from World Class Hospitals in India. Why you should choose World Class Hospitals in India for Most Advanced Minimally Invasive Laminotomy Surgery ? The laminotomy procedure is a minimally invasive endoscopic surgery carried out on an out patient basis.Laminotomy is a surgical procedure that helps to decompress the spinal cord or the spinal nerves that emerge from the vertebral column. It is done with aim of removing any structure that narrows the spinal canal and free the entrapped nerves. In this procedure a small incision is made in the lamina as opposed to laminectomy where the entire lamina is removed. 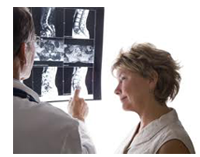 As a result laminotomy procedure decompresses the spinal cord without compromising with the spinal stability. Which Kind of Patients Require This Procedure? Those patients suffering from any of the following conditions for a considerably prolonged period of time without any substantial relief from medications, rest or physical therapy may be advised for this procedure. Any space occupying structure within the spinal canal like herniated or bulging disc, thickened ligament, osteophytes (bone spurs), facet joint thickening can compress the spinal cord resulting in symptoms such as pain, numbness, tingling and weakness of the hand or legs. In extreme cases loss of bowel and bladder control is also observed. Laminotomy aims at making an incision in the lamina, to remove a small part of it, creating room for the spinal cord within the canal. The patients report an immediate relief in their symptoms after the surgery. The patient is allowed to go home in 1-2 days and allowed to begin gradually with his normal activities. Vigorous neck movements should be avoided to allow proper healing of the graft.